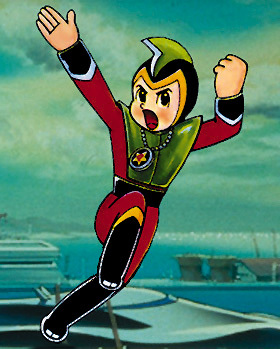 "Prince Planet" was known as Usei Shonen Papi (Planet Boy Papi) in Japan and was produced by Dentsu advertising and K Fujita Associates with the animation by TOJ Tokyo. It was released in Japan in 1965-1966 and aired in Melbourne in March 1967 on channel 9 at 5:00pm weekdays. It's been said that it last appeared on TV in March 1972 on Daryl Somers' Cartoon Corner, but I've received some reports that it had aired after that. According Brad, he watched it as a kid between May and July 1975. And according to both Leo and Rich, it was on WSNS Channel 44 Chicago around 1975-1976, after which it was replaced with Speed Racer. It was described in the TV Week as "New US comic series." The English version was produced by James Nicholson and Samuel Z Arkoff at the famous B grade studios of American International Television Productions. Other works of Arkoff include Amityville Horror (1979), Blacula (1972), as well as a number of monster type movies. A total of 52 episodes were released, but none of them was given an English Episode title. Reuben Guberman (8th Man and Amazing 3) wrote 48 of the episodes and his sister Rose wrote the other four. Reuben died on March 19th, 2000. A great loss but his life will live on through his work. The production info was thought to be lost to history but Andy Shepherd has finally uncovered it. Mark Harris, the director of Prince Planet and the voice of Dan Dynamo, died recently. At the end of the winter of 2001 he was alone unloading a truck in front of his mountain property in Utah, slipped on the ice, knocked himself unconscious and froze to death in the snow. Various voices by Arnie Warren, Frank Schuller, Reuben Guberman, and Gerry Berke. The rights are now owned by MGM who recently bought out Orion Pictures. They have no plans do do anything with Prince Planet at present, but Streamline Pictures had been dealing with Orion several years back for the release and distribution of Prince Planet and Princess Knight. The series begins with the Galactic Union of Worlds at a meeting on the planet named Radion where Prince Planet lives. The chief asks the question "Shall we contact Earth and offer them membership?" A delegate of beings from a number of worlds (including Mars) oppose the membership, describing humans as arrogant, funny-looking, war mongers that are not advanced enough...but nevertheless they are given a chance. Prince Planet is a Universal Peace Corps member who is chosen from hundreds of volunteers to be sent to Earth to bring law and order and a love of peace to Earth so they can become part of the Galactic Union. His assignment: "To fight evil and cruelty whenever and wherever it affects the planet Earth." Prince Planet has an IQ of 300 compared with Earth standards. He has been given a concentrated, scientific and moral education by electroinductive hypnotraining and is classed as a genius. Through the pendant he is given the ability to change into a normal boy and when found on Earth by a girl named Diana Worthy, he is given the name Bobby and lives on a ranch with Diana and her father Pops Worthy. Diana wears a ring which can signal Prince Planet when she is in danger. The main city is Metropol. Prince Planet's pendant receives power (energy) from a nuclear energy center (energy transmitter) on Radion. When Bobby changes to Prince Planet he calls out Peeeeee Pazow! The operators at the centre often forget to charge up his pendant, usually when he is in a fight with an enemy and about to die. But of course the operators remember in the nick of time. Without energy he becomes very weak. The pendant has many uses such as a converter, weapon, transforming to Bobby and back to Prince Planet, for flying, strength, as a torch etc. In many episodes Bobby looks up at the stars at night and gets homesick for his mom on Radion. He realises that when he was given the ability to live as a normal boy on Earth he also had to accept the emotions and desires of a normal boy, including homesickness. In the last episode, Prince Planet has been on Earth for a year and is called back to Radion to make his report to the Council of the Worlds on a special rocket ship sent for him. On his journey back home he remembers about his adventures on Earth and thinks about his friends and enemies that he fought throughout the series. He must now convince the Council of the Galactic Union that the Earth is worthy of membership. He reports that good people far outnumber the evil and beauty is much easier to find than ugliness, but whatever happens the Earth is better for his having been there. The closing words of the series: "Goodbye and thank you Prince Planet." With all Prince Planet's enemies destroyed and friends gone their separate ways, it was doubtful that another series would be made. WHAT A GREAT SHOW! The above description came from 60's Anime's Prince Planet page, and was edited by yours truly (contact me).